Having discussed the joys of overzealous noise reduction and same-pitched speed correction (see 'Press the button... the other one'), let's move on and find out if our two reasonably priced audio editors - one being priced a bit more reasonably than the other, as it happens - can show us some more design choices that we should never, ever reproduce in our own products. Pull up your chair and enjoy caring about what programs are actually used for: we've already seen that it's perfectly fine to feel good about it nowadays. If there's anything we've learnt about sound engineering from 'WinAmp' and amateur DJ sets, it's that crossfading is used with two (or more) sound sources - one of them fading in and the other fading out at the same time (so their fading curves cross - hence the term) so as to ensure seamless transition between different songs or samples. Not so for 'Free Audio Editor' and 'Smart Audio Editor', however. In these two programs, we can apply crossfading even to a tiny selected region of a single open audio file (as a matter of fact, we aren't even allowed to open more than one at a time), without mixing it with anything else. It probably means that we can adjust the fade-out and fade-in curves applied to these regions, thus creating transitions at various points in longer audio files, right? Well, not exactly. The only settings we get to adjust are the volume levels at the starting and the ending point of the selection; then, both programs simply apply a linear fade between the specified levels. 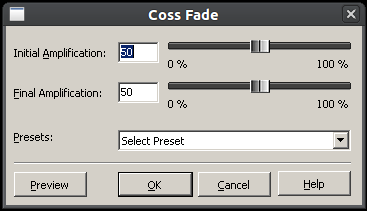 So what crosses does the term 'crossfading' (or, as 'Smart Audio Editor' prefers to put it, 'Coss Fade') refer to in this case? Frankly, I've no idea. Any thoughts? Suppose you've actually finished your recording, with noise reduction and a heap of effects applied, and are now intending to normalise it and export for distribution. You know that online radio stations (and your recording is likely to end up in their hands at some point) broadcast their audio streams in a number of different formats, which means, most importantly, that they will usually have to convert and resample your magnum opus and apply dithering to it. Which, in turn, requires some free room in terms of amplitude boost - in other words, the volume of your recording must be a little bit lower than its absolute maximum in order to prevent clipping from occurring as a result of dithering. The standard practice is to normalise your recording to -0.3db: this difference is barely audible when you're comparing it with maximum normalisation (0db) and yet it allows ample room for dithering artefacts. Suppose you want to do just that in 'Free Audio Editor' (or 'Smart Audio Editor'; we've already grasped that these two are actually the same program, haven't we?). So you open up the normalisation dialogue box, look for the input field... and discover that the maximum level is measured in per cent. Which raises the question: how much per cent is -0.3db between 0db (100%) and -infinity (0%)? Believe it or not, we haven't got to the most immediate problem of the two audio editors in question. Before you actually apply an effect, you must first invoke it from the program's interface. So you roll your mouse pointer across the toolbar, highlighting each button and waiting for a tooltip to tell you that you've finally discovered the sought-after Chorus effect - but instead you discover that it's not what those tooltips actually say. Yes, instead of just telling you the name of each highlighted effect, the tooltips provide you with a long-winded (and dubiously accurate) description of it. How's that for user-friendliness. Naturally, you'd think the button design is clear enough in conveying each button's purpose - but then you notice a button with a sharp sign on it. A labelled button, of all things - signed 'Key'. When you press it, you realise that it has nothing to do with changing the key in which your performance is recorded; instead, it refers to hotkeys customisation. This is when it comes to you: the two programs aren't even supposed to do any sound editing. Their only purpose is to show you how confusing (and seemingly complicated) the world of audio editing is, and look smarter than you to justify their black-box processing techniques. With that idea in mind, I say it's about time we uninstalled them.